Click to see larger images. Images will open in a new window. See my flickr page for more images and for source pictures. 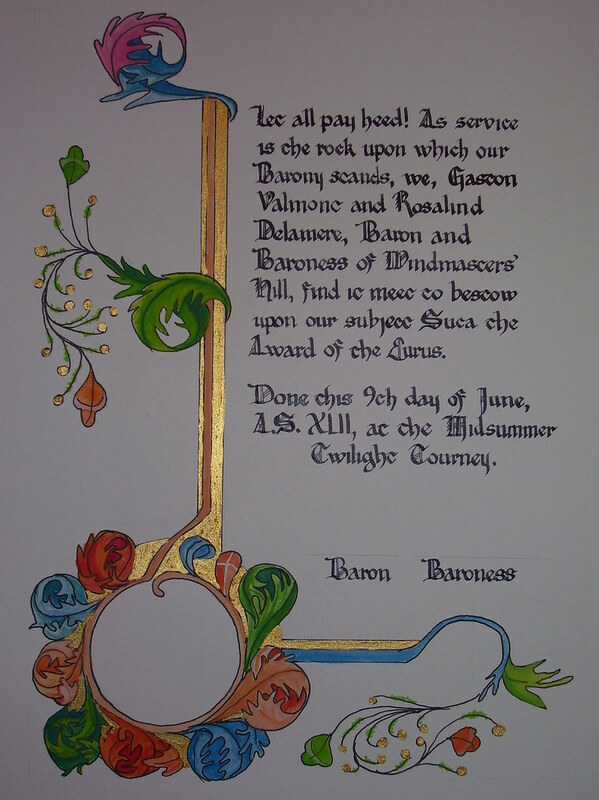 Invitation to Baroness' Tea, Ymir 2009. 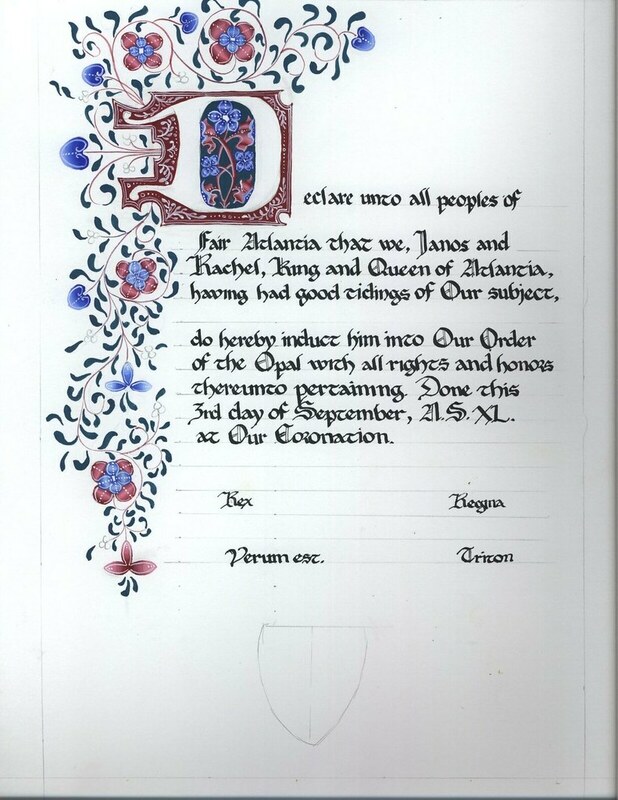 Done in the Hastings Hours script. 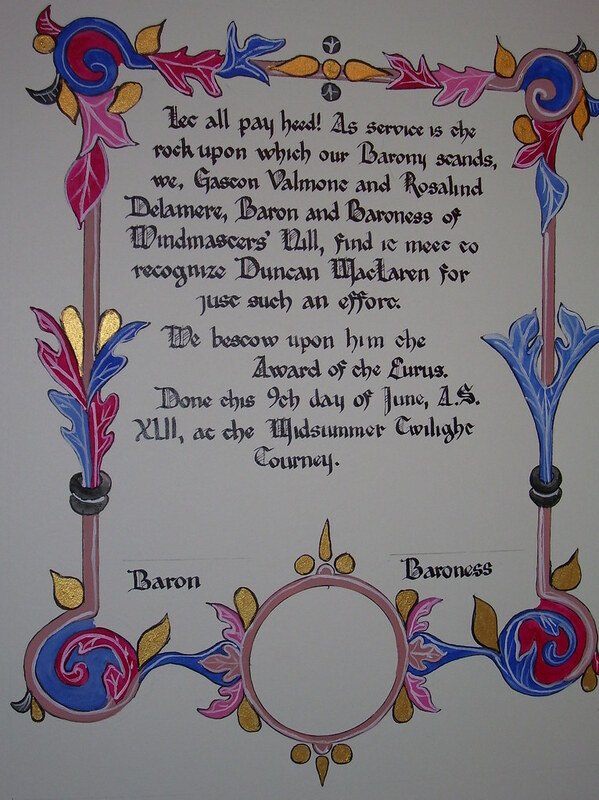 Barony of Windmasters' Hill Honorary Member scroll for Baron Alejandro Mateo Ramirez. Maestra Lucia and I worked on this together. I designed and drafted the picture and she painted it. Based on St. Luke's page in the Leon Bible of 920. 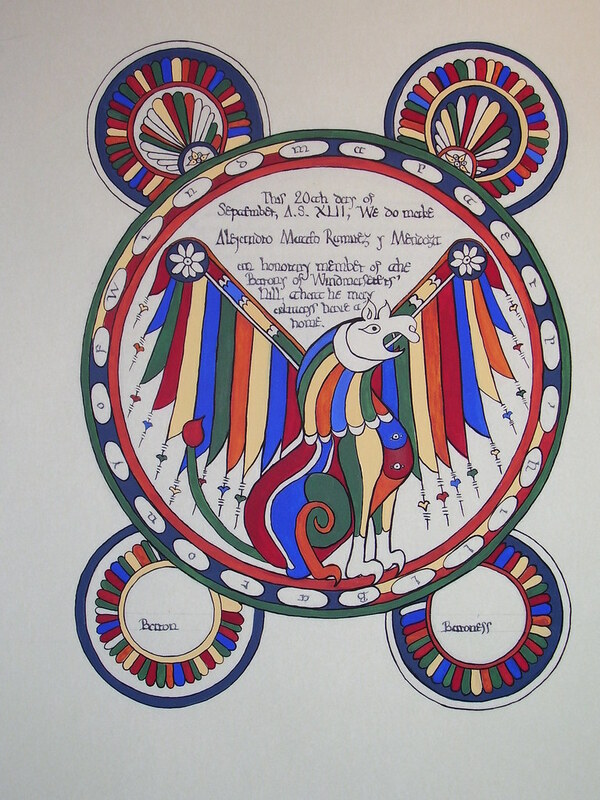 In Early Spanish Manuscript Illumination (Braziller: NY, 1977). 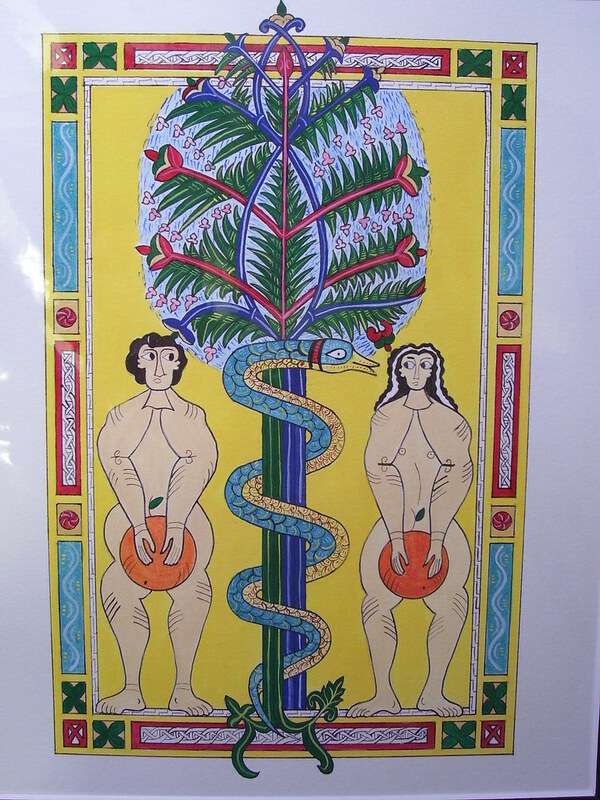 Adam and Eve with Oranges. A fun piece painted for a themed A&S competition. Inspired by f. 18 of Escorial Beatus, "Fall of Adam and Eve." In Early Spanish Manuscript Illumination (Braziller: NY, 1977). Late 10th century? The Tale of Wistric, a poem created for my lord on the occasion of his Free Scholar prize. Words by Livia Zanna. 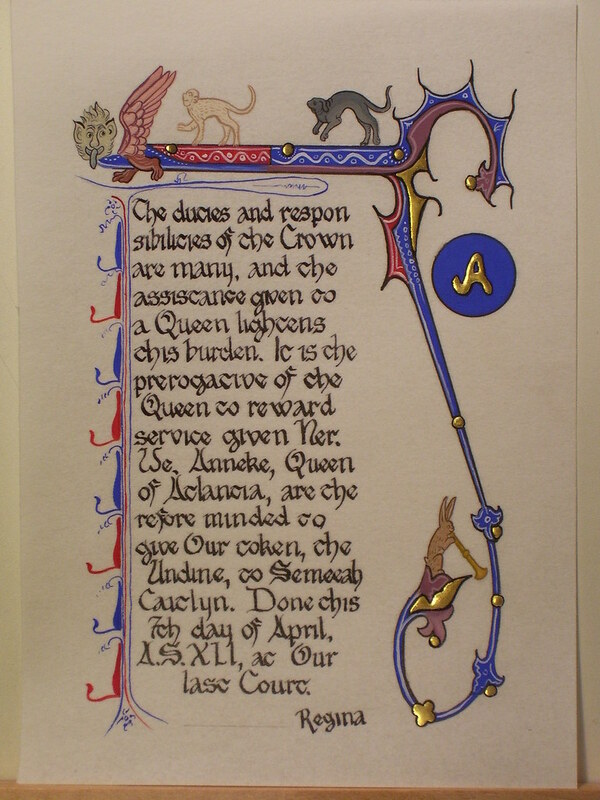 The inspiration is the script and image from f. 26v in Arundel 91. Pre-calligraphy. Based on "Saint John with the Angel of Thyatira," fol. 68 of the Beatus of San Millan. 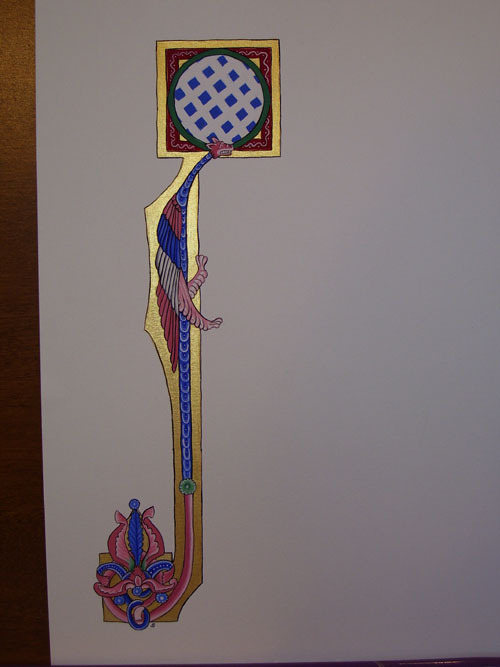 In Early Spanish Manuscript Illumination (Braziller: NY, 1977). Late 10th century? Image of Saint John tweaked to resemble recipient, Letia Thisteltheuyt, dressed in the colors of her rapier garb and holding a sword. She is reaching for half a Tempest, the baronial fighting award. After she was granted this award, she wore her medallion into battle, where it was broken in half by the enemy. Undine for Semeeah Caitlyn. This is my first attempt at gold leaf. Based on Scholastic Miscellany, Burney 275. 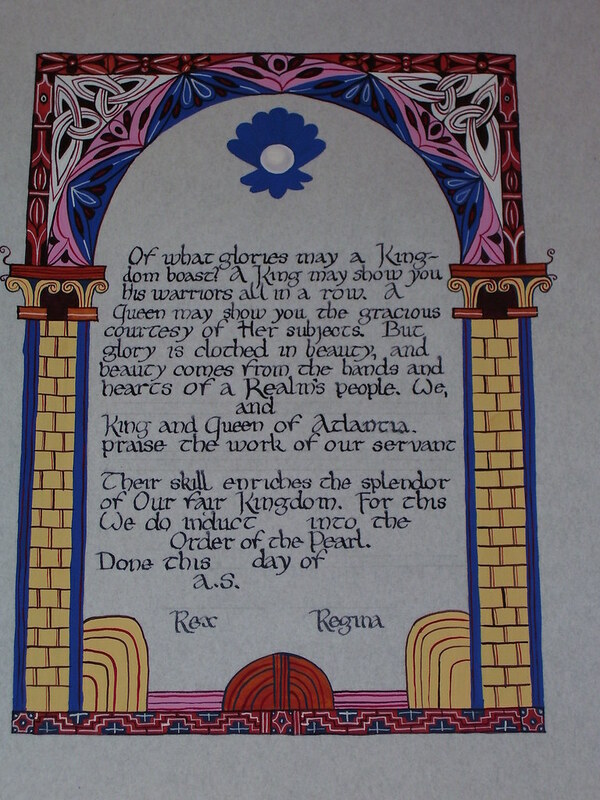 Prize scroll given at Atlantian Assessment 2007. 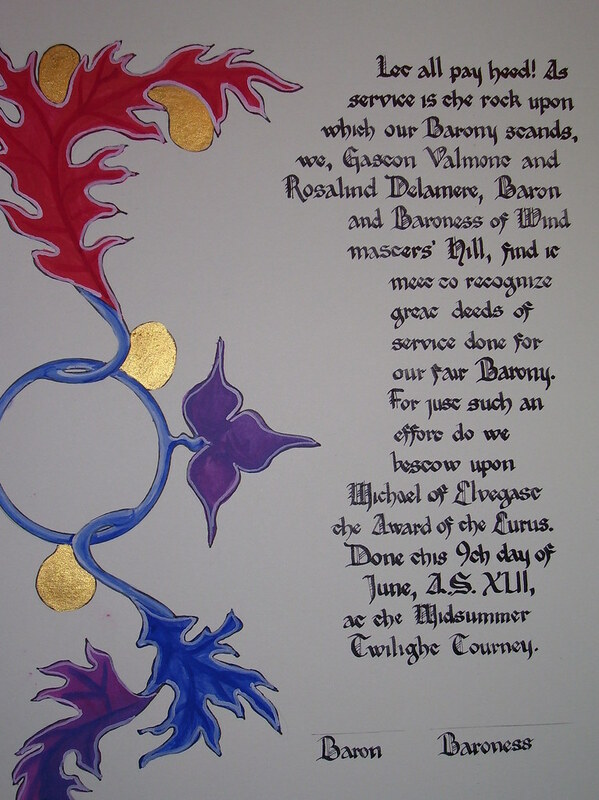 Unfortunately, we did not get a full picture of the scroll after its completion. However, here is the draft of the picture I painted on it. 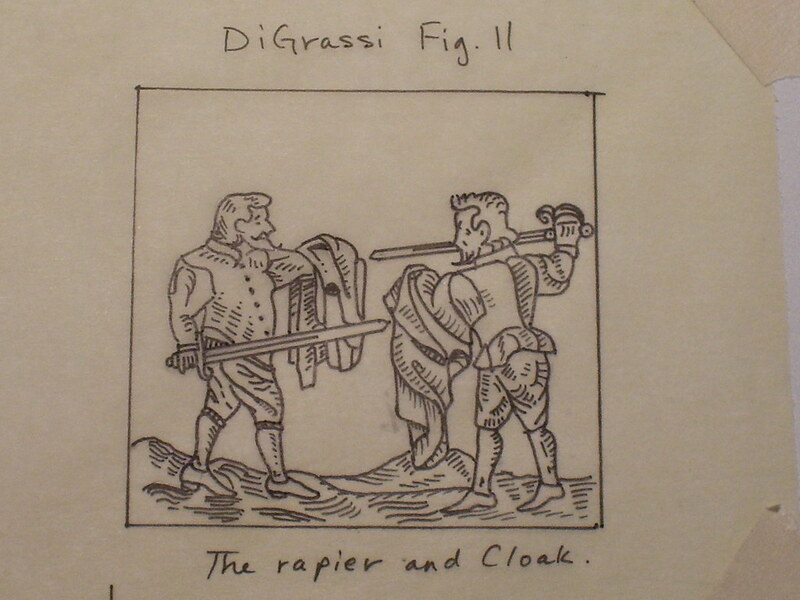 It is a copy of a posture in the DiGrassi fencing manual. 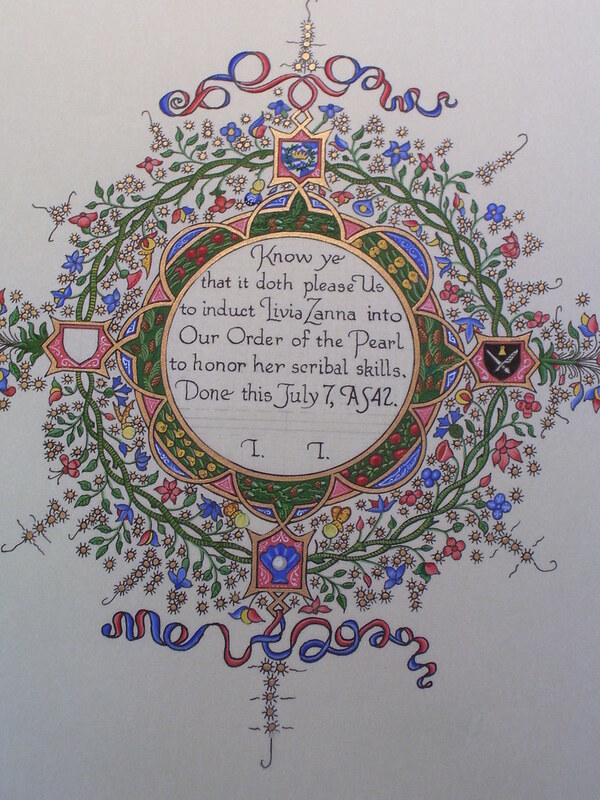 Pearl Scroll for Livia Zanna. Another combined effort from Maestra Lucia and myself. From The Painted Page, page 69, f 28v -- a 1450s Italian translation of St. Augustine. Eurus for Suca. This and the two following are my third attempt at calligraphy. Illumination by Lady Tessa de Spina. Eurus for Michael of Elvegast. My third attempt at calligraphy. 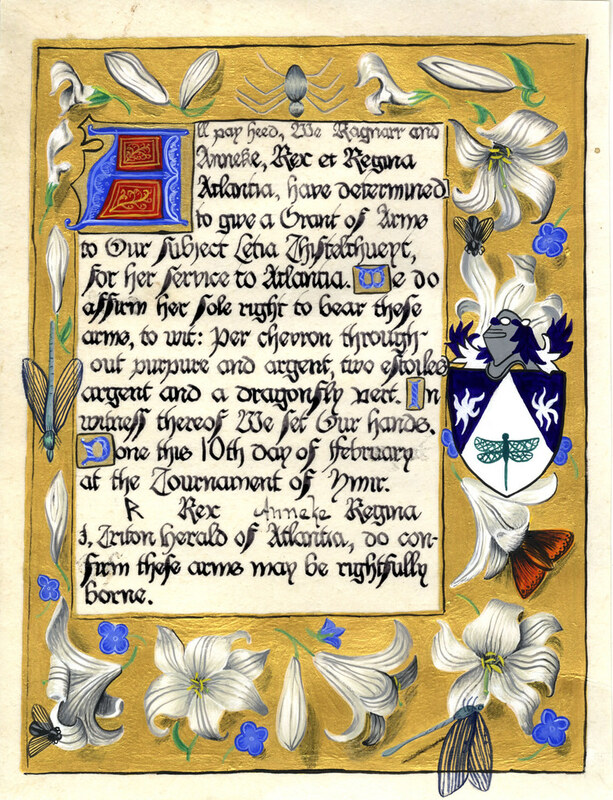 Illumination by Lady Tessa de Spina. Eurus for Duncan MacLaren. My third attempt at calligraphy. 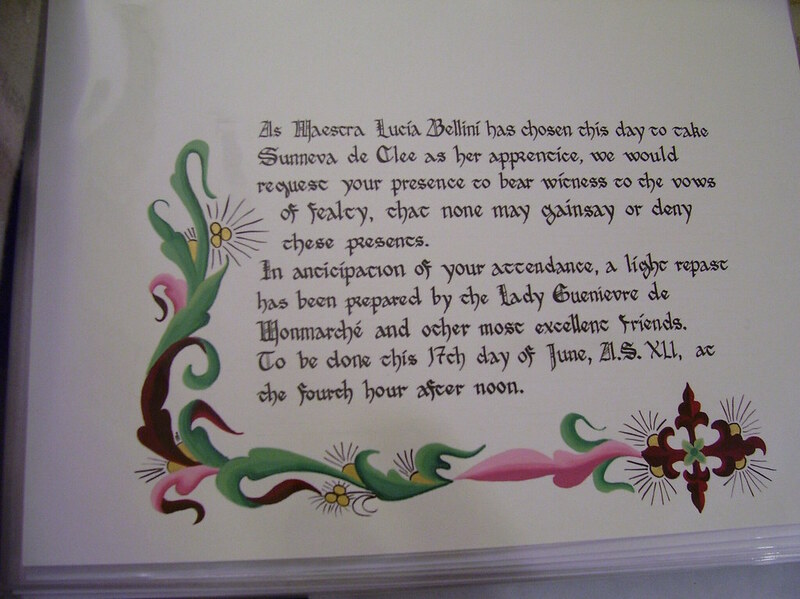 Illumination by Lady Tessa de Spina. Grant of Arms for Letia Thisteltheuyt. This is my first attempt using a hand-cut quill and vellum. 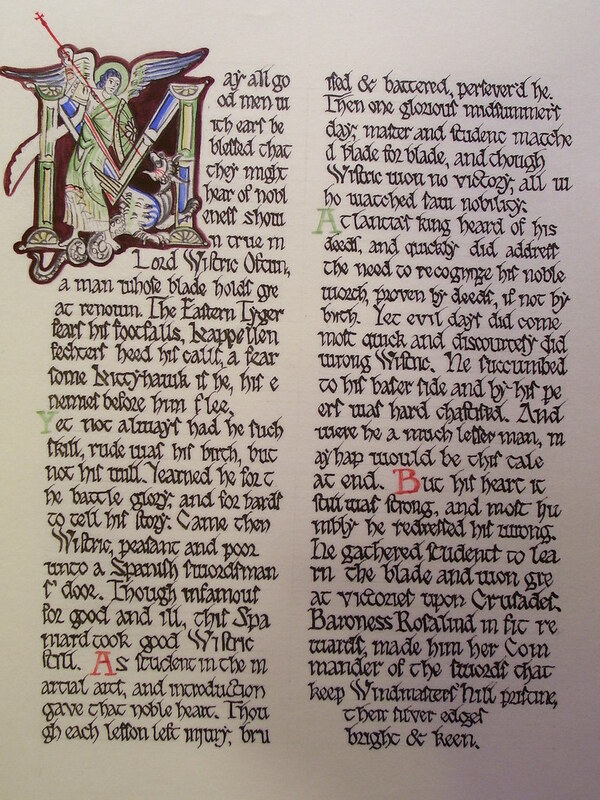 This scroll is based on the "Prime" from the Hastings Hours. Coral Branch for Livia Zanna. Maestra Lucia Bellini and I did this piece together. She picked out the design, wrote the text, and painted most of the figures and all of the faces. I traced the design, painted the vines and leaves and all the figures on the bottom except for the goose. 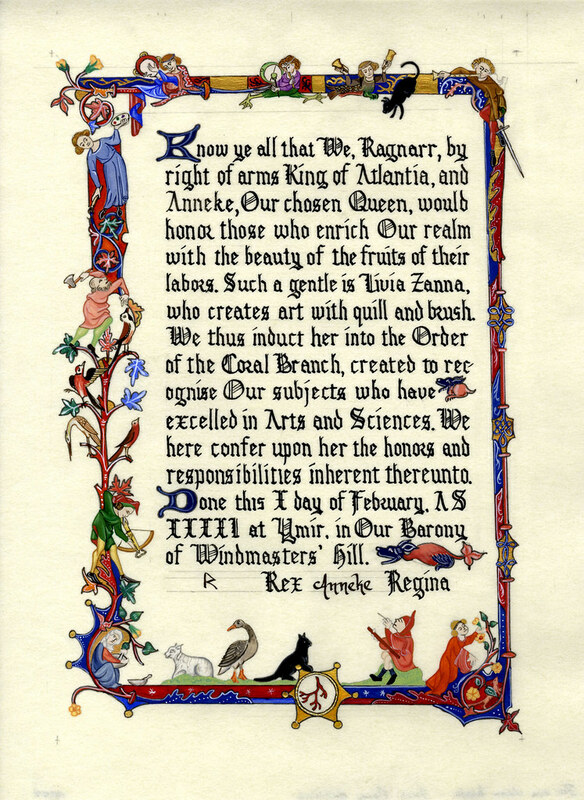 Based on a page from the Peterborough Psalter. 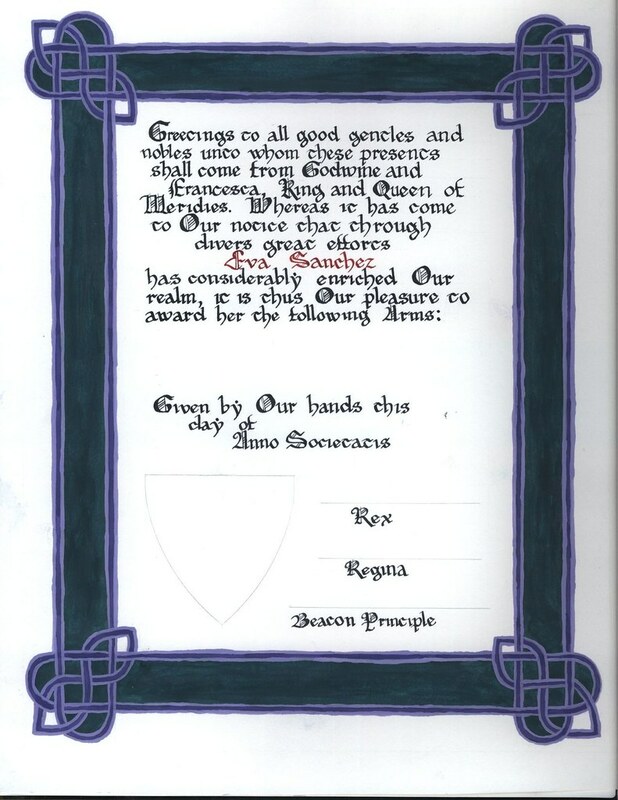 Award of Arms for Eva Sanchez. This is my second attempt at calligraphy. The painting is by Lady Mariana de Salamanca. Invitation to apprenticing ceremony. 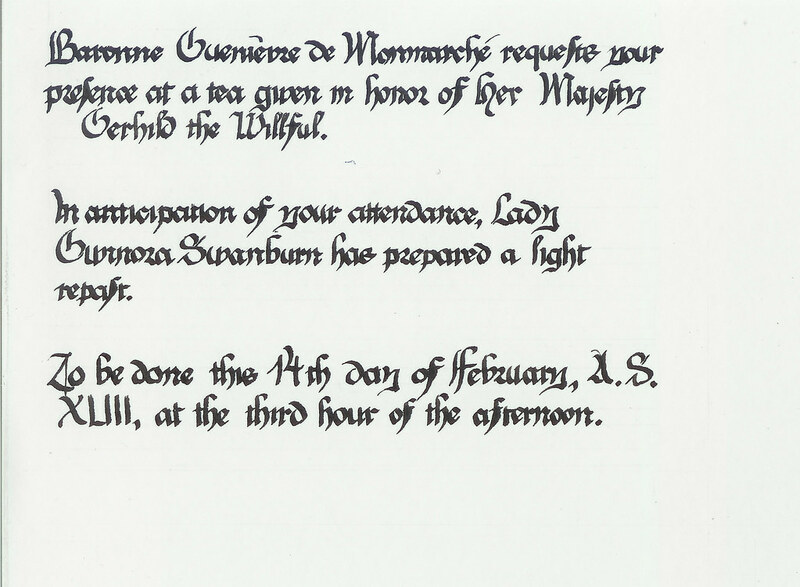 Invitation to my apprenticing ceremony. The painting was actually based on a 12th c. English sample of acanthus leaves from the British Library, but for the life of me I can't find it again. Opal scroll. Opal for a squire based on Ptolemy's Almagest (c. 1213), MS lat. 16200, f. 4r. Presented at Sapphire Joust 2006. Lady Livia Zanna eventually added the calligraphy. Kittyhawk for Duchess Kyneburh Bothuile. 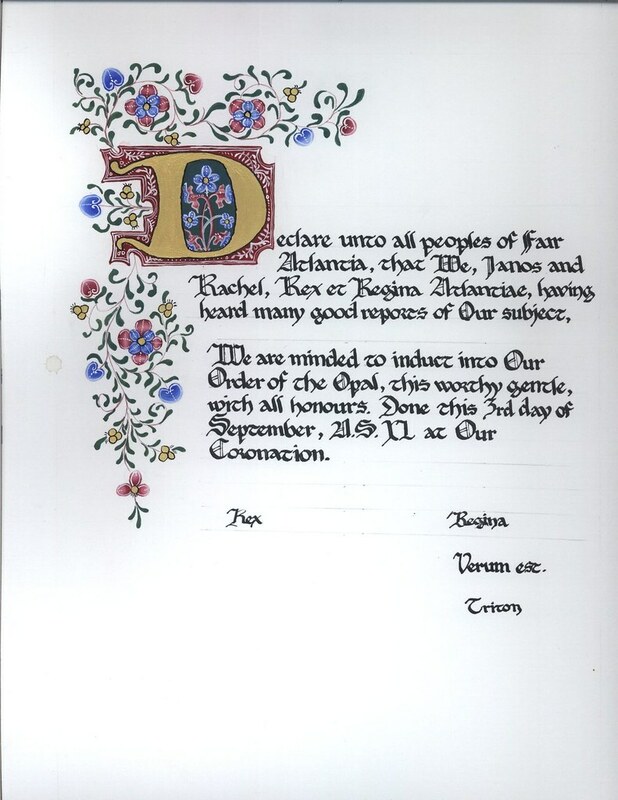 Based on Arundel 190 f. 91v and Yates Thompson 27 f. 47d. Opal for Beatrice Villani. Opal presented to Lady Beatrice Villani at Ymir 2006. 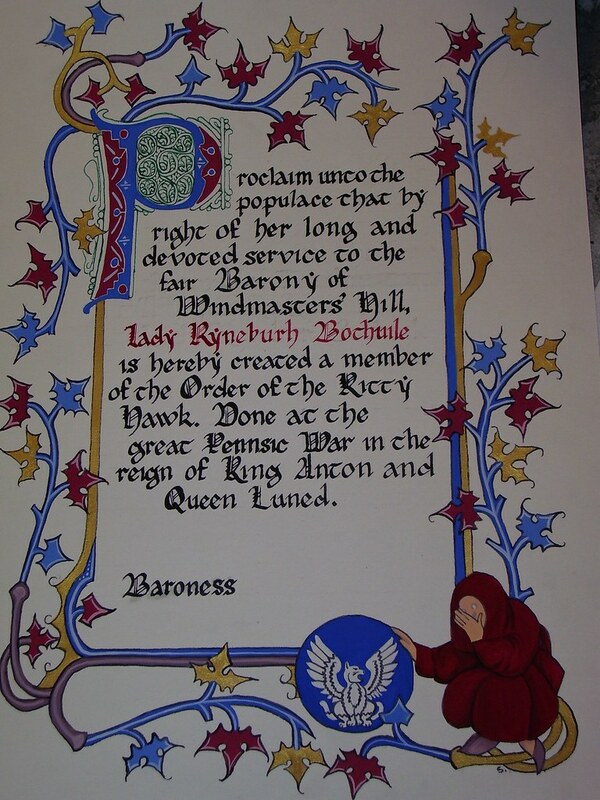 Lady Livia Zanna did the calligraphy and the capital. This was painted from a professional photograph. The photo is copywritten so I have not reproduced it anywhere. 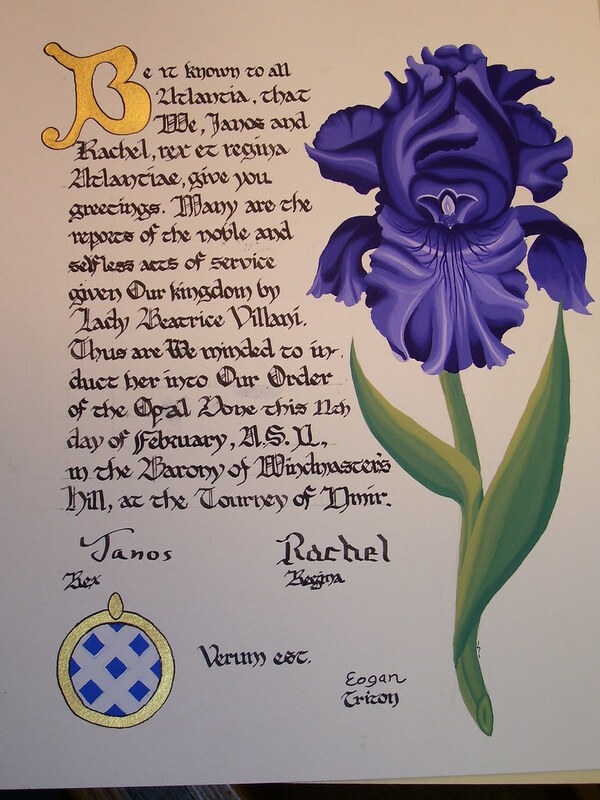 Pair of first scrolls, with calligraphy by Lady Livia Zanna. Won the scroll blank competition at Atlantia Kingdom 12th Night 2006. Based on the Fon Memorabilium Universi by Domenico Bardini (c. 1444-1448). Second half of pair, unfinished at time of scanning.